The hotel standard check in time is after 1400 hours on the day of arrival. Should the guest require the room before stipulated time, it is highly recommended that the reservation is placed on the night prior to their arrival at full day charge, unless specify otherwise in written confirmation. The hotel standard check out time is 1200 hours on the day of departure. After which, any request for check-out before 1800 hours, a half day of the applied room rate is chargeable and full day thereafter. Please note that any early check-in and late check out request will subject to availability. Seductive sanctuary in the heart of Chinatown, boutiques, restaurants, bars, clubs, financial district, theatres, Sentosa Island, Marina Bay Sands, Orchard Road, National Museum of Singapore, Little India, Arab Street, Boat Quay, Clarke Quay and the Singapore Flyer are all within easy reach. Hotel does not provide car park facility. 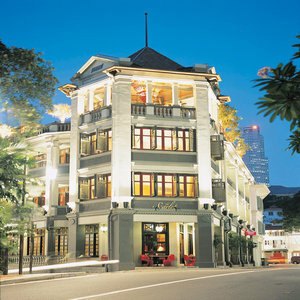 Singapore s original boutique hotel, The Scarlet is a sensual delight with an interior specifically designed to wow. With an emphasis on rich reds and shiny blacks, the rooms are sultry and enticing with every space having its own individual character. A superb roof terrace is the perfect spot for evening cocktails and casual dining and there is even a Jacuzzi to enjoy under a starry sky. The Scarlet is a Small Luxury Hotels of the World property.